I paid the price recently when I complained about the potholed, rugged road that leads to my home. As a tax paying citizen, I was convinced that I have the responsibility to demand for better services. This road has been rugged for a year now and gets worse by the day. Some drivers that use this road said that they have either replaced shock absorbers, suspension bushes and other parts. My fellow road users are quiet, they are are hoping against hope that one day the Kampala City Council Authority (KCCA) will answer their prayers and construct this road. 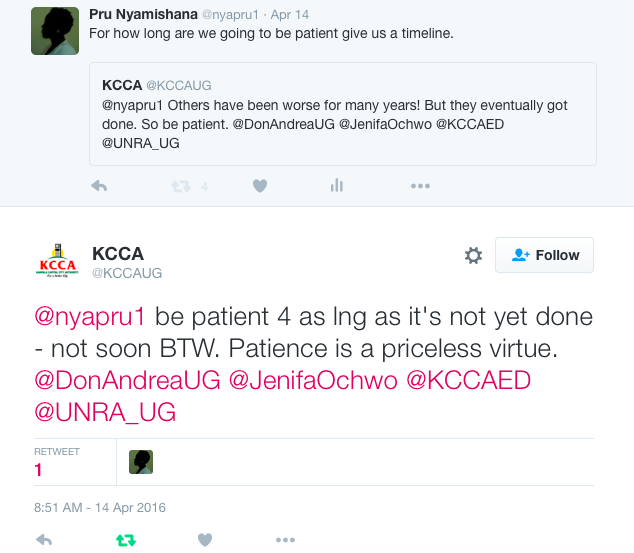 So I decided to lodge a complaint through the KCCA Twitter handle @KCCAUG only to hit my head hard on a wall. I felt hounded, walked away with my tail in my legs. I will not blame the tweeting fingers, it seems that the impunity bug to have bitten them too just like most government bodies. And as this impunity goes on, Ugandans are supposed to watch in silence. We are supposed to nod our heads in agreement at the promises. Ugandans are supposed to sit back and praise them. The cancer machine at Mulago hospital broke down; the Ministry of Health will tell Ugandans to be patient while the patients are dying. When you tell KCCA and UNRA that the roads are in a pathetic state, they ask you to be patient you are not a priority, their clear priority is constructing a multi million-shilling fountain on Kampala road that will not work after three months. Give us better schools, nah, we shall instead demolish Shimoni demonstration school and leave the land idle. You are right. We must not be silent. 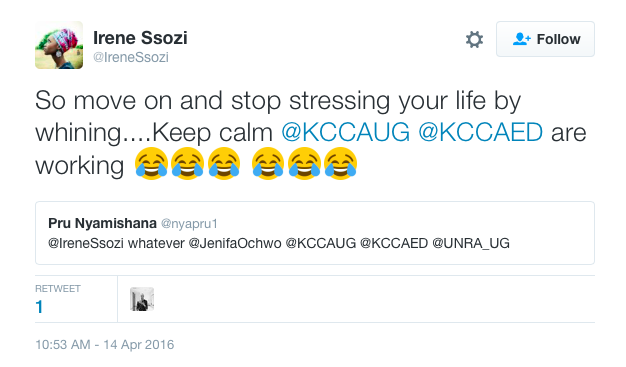 I am shocked at the responses you received from KCCA via twitter. They are usually more cordial in their interactions. Let’s hope that some decent member of staff will take this up and get the road works done. Quoting “Patience is a priceless virtue” does not in any way help in this situation. A promise of a timeline would be much better.